Are you ready to quit dieting FOREVER and start nourishing yourself – and your family? 1. Are you sick and tired of quick fixes that don’t work and empty weight-loss promises? 2. Are you ready to quit dieting and start nourishing yourself – and your family? 3. Are you ready to change your relationship with food and the scale – FOREVER? 4. Do you think healthy eating means preparing complicated meals using fancy ingredients or cooking one meal for you and another for the family? 5. Do you think healthy eating means missing out on life’s special occasions or feeling deprived? 6. Do you think that you’re a weak person who lacks willpower? I know you already feel like you’ve tried every diet there is, and that after each diet, you’re left feeling like a failure. The internet & media is filled with ads for quick fixes that have empty promises & it’s overwhelming! .. what if I told you that there is a way, a simple sustainable way, to take back control & change your relationship with food FOREVER & that you will never have to diet again! What if I told you that you can learn these transformational habits for yourself! You are sick of wondering what’s wrong with you and why you can’t maintain a healthy weight. You’re ready for an ENTIRELY NEW APPROACH that will transform your relationship with food yourself once and for all! Soon after I turned thirty I returned to full time work as a single mum. I suddenly had a lot less time for myself. Long work hours and lack of planning led to weight creeping on until I had gained 21kgs at my heaviest. My BMI landed me in the ‘obese’ range. I was miserable. I refused to buy nice clothes as this wasn’t the ‘real’ me. I felt frumpy and avoided social situations unless and refused to have my photo taken. I tried a range of quick fix diets, you name it I tried it – shakes and endless Very Low Calories Diets, fruit only until lunch, fat blaster tablets the list goes on. They were all essentially the same – limited weight loss (they were all too restrictive and boring to sustain), limited exercise (you couldn’t exercise as you had no energy) and all resulting in me re-gaining any weight I did lose, and then some. I was a giant yo-yo! I was fast approaching 40 when I had a health scare. It was then that I decided once and for all enough was enough and I had to do something about my health and weight. This time it had to be sustainable – I was sick of dieting, depriving myself and feeling guilty about food. I started paying close attention to what I was eating. I modified what and when I ate, but never considered myself to be on a diet. No counting calories, no shakes or pills – just real, whole foods. I’ve continued to maintain this life style and haven’t ‘dieted’ in over 6 years. Frustrated by the weight loss industry I now help other women change their relationship with food and eating, and to get off the diet merry-go-round too. To date, I’ve worked with many clients just like you and have shown them how it is possible to retrain our bodies and minds. 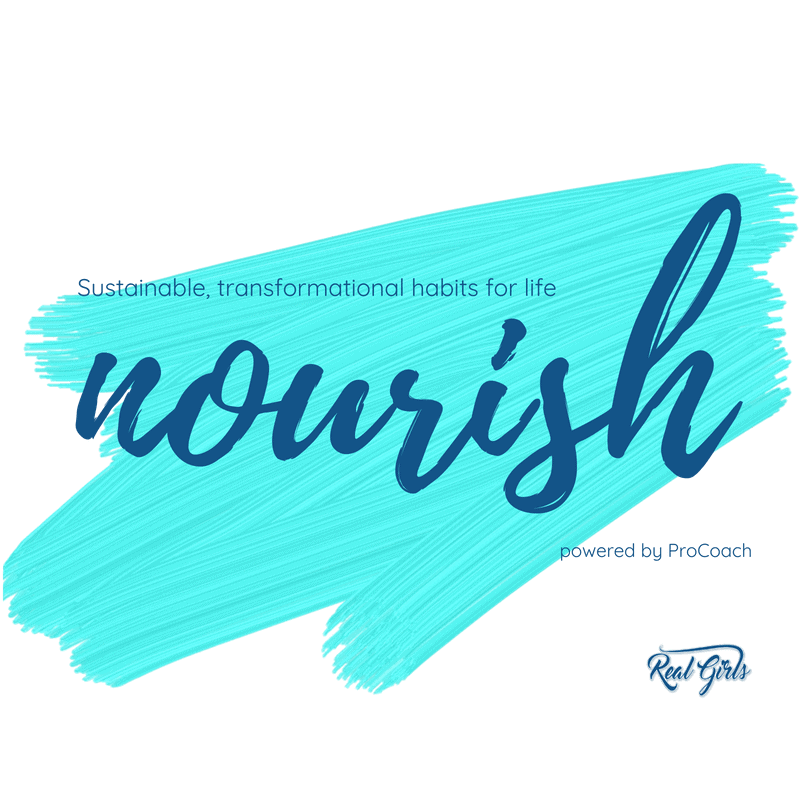 Nourish is a holistic nutrition program that guides you through the process of completely transforming your current eating & lifestyle habits so that you have a powerful and positive relationship with your body and the food you nourish it with. I have designed Nourish so that no matter where you live you can learn how to nourish yourself and your family the Real Girls way. There will never be shakes or pills to buy, calories to count or guilt and deprivation. Holistic nutrition coaching – transformational, sustainable habits for life..
A Personal Plan – It starts with learning about you – your goals, your needs, and your life – not mine or anyone else. We’ll put it all together to create a personalised plan to help you look and feel your best. Feedback from me – As your work through your daily practices, I will check in on you and provide you with feedback when appropriate. You can also message me anytime with questions. 1:1 Coaching calls – weekly, fortnightly or monthly – you decide. This is where we can brainstorm concerns you have, strategies to implement what you have learned into your life and to answer any questions you might have. Simple Daily Lessons – you’ll be delivered, strategic daily lessons & practices that add up to a huge life changing transformation. Daily Workouts (optional extra – Nourish + Sweat) Workouts delivered daily, taking the guesswork out of what to do each day. All exercises have a demo video that works on any platform so you can access your workouts 24/7 from anywhere. SUPPORT, MOTIVATION and INSPIRATION – because change isn’t easy, but with support & guidance it is that much easier – heck! It can even be fun! * Feeling good, confident, and in control of yourself and your life. You will receive all of the above resources and benefits, including 1 coaching call a month. You will receive all of the above resources and benefits, including 1 coaching call a fortnight. You will receive all of the above resources and benefits, including 1 coaching call a week. Or for optimal results add a little “Sweat”;)…….workouts you can access online, anytime! Weekly workouts accessible online, anytime. Or book a consult to discuss the best option for you. “My biggest fear before I started Empowered Nutrition was not being able to be consistent, but the way the daily lessons are delivered makes it easy to stay on track! I really like how informative the lessons are and my fortnightly check-ins with Joanne. Nourish is way of eating for life. No deprivation. It’s not all or nothing. You won’t feel like you’re on a diet – because you’re not!. Are you ready to quit dieting forever? Are you ready for an ENTIRELY NEW APPROACH that will transform your relationship with food yourself once and for all!